These bridal shower games to play have a kitchen theme to them. I have assembled my favorites, most of which were played at my own wedding shower in 1987. 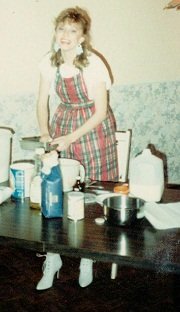 And yes, this is a picture of me playing Make a Simple White Cake at my own shower. Some games are competitive while others are just activities for the fun of it. My sister Melissa was the hostess at my own bridal shower. The invitation was on a lunch sack which was folded over into three's before mailing. On the inside wasshe had placed a poem she had written especially for the occasion. You know she'll never fit a mold. To be big, and bright, and bold! Which is in the great South Bay. Is that YOU will be there. So show her that you care. Be it kitchen, bed, or bath. Frederick's always make her laugh. Your favorite spices of the day. That we could put in a book.